One thursday afternoon when every one started to relax in prepration for the coming week end , actually i was feeling tired after a busy week ,when my mobile phone rang , he was one of my colleagues in one of our hospital wards , He said ,sorry for calling you at the end of your duty but i have a critical patient for your consultation suspected CNS infection ,He was admitted yesterday evening with mild fever and severe headache associated with nuchal rigidity now the patient is confused .I think the patient needs ICU admission for fear of more deterioration , he said . The patient was 21 years old ,driver , not known to be diabetic or hypertensive , no history of drug abuse or addiction , no history of seizure attacks but there is a history of head trauma three months earlier no history suggestive of CSF rhinorrhea .. Family history was not contributory . (Q) was this patient indicated for lumbar puncture ? CT scan of the brain in this patient revealed an isodense crescentic subdural mass lesion extending from the left frontal and parietal lobes with mass effect ( effacement of the left cortical sulci, compression of the left lateral ventricle and shifting of the midline to the right side . 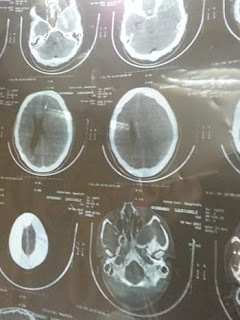 Diagnosis left subacute subdural hematoma . for neurosurgical evacuation.